Law Review elected a new President, Gillian S. Grossman; included gender to the list of criteria for new selected new editors; and added two more editor positions, according to the Harvard Crimson. According to the Board of Student Advisors, approximately 33 percent of its members self-identified as female, 33 percent self-identified as males and 33 percent did not report their gender. According to the Harvard Law Review, approximately 25 percent of its 88 members are female and 75 percent are males. According to the Harvard Legal Aid Bureau, approximately 40 percent of its 51 members self-identified as female, 44 percent self-identified as male and 17 percent did not report their gender. According to the BSA, approximately 17 percent of its 42 members self-identified as non-white, 50 percent are whites and 33 percent did not report their race. Law Review did not have data on the racial composition of their current board of editors. According to HLAB, 31 percent of its 51 members self-identified as non-white, 52 percent self-identified as white and 17 percent did not report their race. According to the BSA, approximately 2 percent of its 42 members self-identified as Lesbian Gay Bisexual Transgender or Queer, 64 percent did not self-identify as LGBTQ and 33 percent did not report. Law Review did not have data on the sexual orientation of its members. 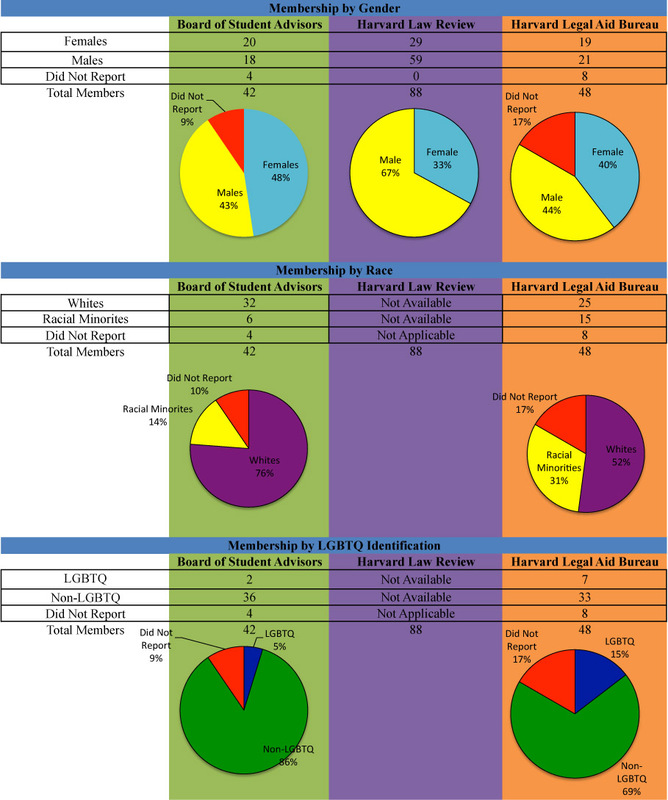 According to HLAB, 2 percent of its 48 members self-identified as LGBTQ, 64 percent did not self-identify as LGBTQ and 33 percent did not report their sexual orientation. As stated by their respective presidents, all three organizations have policies against releasing the confidential demographic data of applicants. All three organizations are composed of 2Ls and 3Ls. “We are disappointed that this year’s Law Review has a low number of women editors and are continuing to investigate why this occurred. In the meantime, we plan to continue our women’s outreach efforts, and we strongly encourage incoming 1L women to reach out to current Law Review editors for more information and to take the writing competition in May.” Law Review President Conor Tochilin, Law ’13 and Business ’13, said. The upcoming acadmic year’s Law Review is 25 percent female, according to Law Review President Conor Tochilin, Law ’13 and Business ’13. 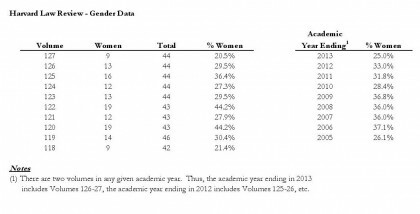 This represents an 8 percent drop in female membership from the last academic year. Tochilin also provided a chart containing the Law Review’s female membership since 2005. According to the Board of Student Advisors, approximately 48 percent of its 42 members self-identified as female, 43 percent self-identified as males and nine percent did not report their gender. According to the Harvard Law Review, approximately 33 percent of its 88 members are female and 67 percent are males. According to the Harvard Legal Aid Bureau, approximately 40 percent of its 48 members self-identified as female, 44 percent self-identified as male and 17 percent did not report their gender. According to the BSA, approximately 14 percent of its 42 members self-identified as racial minorities, 76 percent are whites and ten percent did not report their race. Law Review did not have data on the racial composition of their current board of editors. According to HLAB, 31 percent of its 48 members self-identified as racial minorities, 52 percent self-identified as white and 17 percent did not report their race. According to the BSA, approximately five percent of its 42 members self-identified as Lesbian Gay Bisexual Transgender or Queer, 66 percent did not self-identify as LGBTQ and ten percent did not report their race. 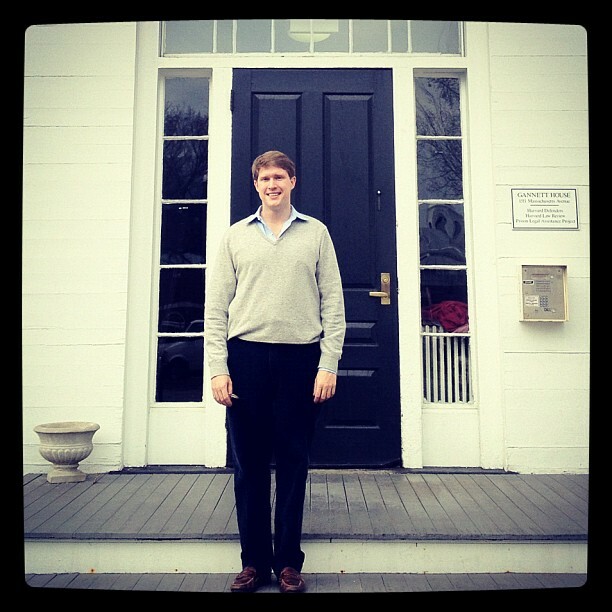 Law Review did not have data on the sexual orientation of its members. 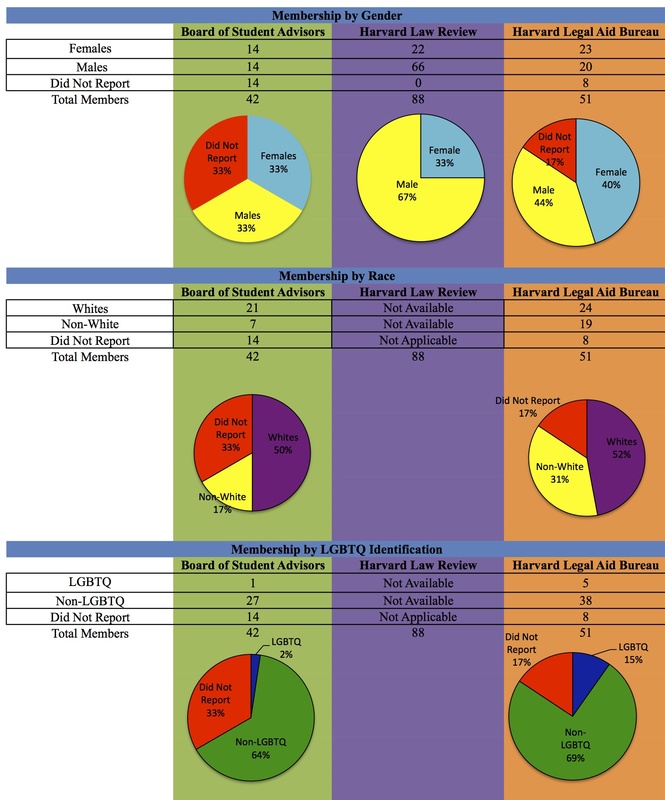 According to HLAB, 15 percent of its 48 members self-identified as LGBTQ, 69 percent did not self-identify as LGBTQ and 17 percent did not report their race. “Each year, the Editorial Board performs extensive outreach efforts to encourage all 1Ls to compete in the [Law Review] Competition and these efforts are continuing in earnest this year,” Law Review President Conor Tochilin, Law ’13 and Business ’13, said. The Office of Admissions’ Class Profiles for the 2010 and 2011 entering classes indicate that 48 percent of those two classes are female and 37 percent are students of color. We strongly urge the Harvard Law Review to invite President Barack Obama, a former President of the Law Review, to participate in a symposium organized by you to answer the contemporary constitutional crisis precipitated by the concentration of power in the Office of the President of the United States irrespective of party affiliation. The danger of an omnipotent president is institutional, not personal. Each president betters the instruction of the unconstitutional abuses and usurpations of his predecessor. The Office of the President is no longer under the law, but is the law. A true patriot, Thomas Paine sermonized, saves his country from his government. Based on secret facts and secret law, the presidency assassinates American citizens on his say-so alone. Based on secret evidence, the presidency detains American citizens for life without accusation or trial. In the dark of night, the presidency employs extraordinary renditions to dispatch non-accused detainees to foreign countries for torture or worse. Without warrants or probable cause, the presidency spies on American citizens, creating intimidating government dossiers (like the Soviet Union). Invoking state secrets, foreign policy and executive privilege, the presidency blocks the victims of unconstitutional wrongdoing from judicial remedies, including extra-judicial killings. Violating his constitutional duty to faithfully execute the laws, the presidency refuses to prosecute torture, illegal surveillance and other grave crimes motivated by political advantage. The presidency usurps the war powers of Congress whom the Constitution’s makers relied upon to prevent ill-conceived military adventures abroad that bankrupt the nation at a frightful cost in human carnage. The presidential war against Libya marks the high water mark of the usurpation. It was initiated without congressional authority. It was continued in violation of the War Powers Resolution. It was fought without funds appropriated by Congress for the purpose. And the presidency claimed constitutional power to war unilaterally in the future whenever the President proclaims some national interest is at stake. Behind closed doors, the presidency spends trillions of unaudited dollars on objectless military endeavors and bank bailouts. The presidency issues “signing statements” to circumvent duly enacted legislation. The presidency substitutes executive agreements for treaties to evade the Senate’s check on ill- conceived international military or economic obligations. The presidency issues special interest regulations that enable K Street lobbyists to enrich their clients either by direct subsidy or by handicapping competitors. In sum, the presidency of the United States commands vastly more power over Americans than did King George III whose tyranny provoked the American Revolution. We are not alone in discerning a presidency claiming and exercising tyrannical powers. The American Bar Association, notorious for caution verging on timidity, has issued three reports on presidential excesses. See Task Force on Presidential Signing Statements and the Separation of Powers Doctrine (August, 2006); Task Force on Domestic Surveillance in the Fight Against Terrorism (February 13, 2006); and, Task Force on Treatment of Enemy Combatants (February, 2003). The House Judiciary Committee similarly issued a report that chronicles serial constitutional violations of the presidency. See Reining in the Imperial Presidency: Lessons and Recommendations Relating to the Presidency of George W. Bush (Jan 13, 2009). George Washington University Law School Professor Jonathan Turley also delineated serial constitutional misconduct in a Washington Post Outlook article; 10 reasons the U.S. is no longer the land of the free (January 13, 2012). Harvard Law Review is endowed with the intellectual fuel to redress constitutional waywardness. To shy from a candid examination of the presidency at this time of chronic vandalizing of the Constitution because of preoccupation with other legal issues would seem irresponsible—first cousin to Nero’s fiddling while Rome burned. We are confidant you will not shrink from your duty. We believe your symposium should consider questioning President Obama by yourselves and a panel of renowned constitutional experts about the powers of the presidency enumerated in Article II, As Justice Louis D. Brandeis lectured, sunshine is the best disinfectant. And a more informed citizenry is the bulwark of our Republic. We are eager to assist in any way you might request in planning and holding the symposium either in Washington, D.C. or Cambridge. Bruce Fein, Law ’72; North Carolina Representative Walter Jones and Ralph Nader, Law ’58 signed this letter to the Harvard Law Review on January 31, 2012. A signed copy of the letter is available here.